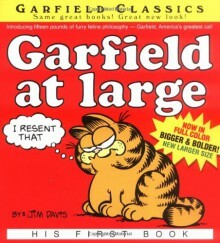 Like every great lasagna, Garfield was born in the kitchen of an Italian restaurant on a winter's night in 1978, while outside snow fell like gratd Parmesan cheese. He weighed five pounds, six ounces at birth--that's big for a kitten!--and right from the start showed a passion for Italian food. the restaurant owner, forced to choose between Garfield and closing his doors for lack of pasta, sold Garfield to a pet store. Garfield thought he was a goner until Jon Arbuckle walked in the door. The rest is history. Garfield is simply Garfield, there isn't much to it. Some of these are pretty funny but others are kind of "meh".